Our i27XC rims are 27.5mm wide on the inside (inner width) and 33mm wide on the outside. They weight 370 grams per rim for the 650b/27.5 and 390 grams per rim for 29 inch. Our i31AM rims are 31mm wide on the inside (inner width) and 37mm wide on the outside. They weight 420 grams per rim for the 650b/27.5 and 450 grams per rim for 29 inch. Our i33EN rims are 33mm wide on the inside (inner width) and 38mm wide on the outside. They weight 480 grams per rim for the 650b/27.5 and 500 grams per rim for 29 inch. Our factory is located in Xiamen China – just across the water from Taiwan and a hub of carbon manufacturing, especially in the bike industry. The rims are manufactured in our factory then wheelsets are built and decals are baked on all in house in Xiamen. We ship our wheels direct to you from our factory and they usually arrive about 5 business days after manufacture is complete. We use two brands of hubs in our wheelsets for simplicity. 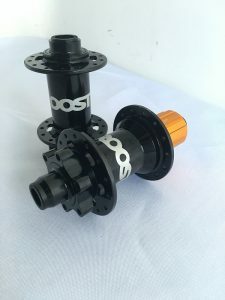 Our own ROOST Chosen hubs which offer unparalleled engagement with a full 150 points of engagement as well as DT Swiss 350 and 240 hubsets with the 54t star ratchet upgrade. All rim molds use curved airbags to ensure a smooth inside wall of the rim and consistent curing so that strength is maintained throughout the rim’s circumference. A wider rim means more air volume in your tire provides a more dynamic, supple ride. Just like having a higher air volume in your suspension provides better suspension characteristics, more volume (not pressure) in your tire does the same. Wider rims square off your tire and create a larger contact patch between your tread and the ground. More tread equals more traction on the up and the down. Wider rims make your sidewall more straight because there is less curvature to accommodate a rim narrower than your tire’s tread. A straighter, more “standup” sidewall means more stability and less burping when running tubeless. Better strength-to-weight ratio. The wider profile on the rim means that less material is needed to achieve the same strength. In addition, your tire will “act wider” and so you can use a smaller tire to achieve the same results as a larger tire – and save weight in the process. What are the Benefits of Running a Wider Rim? Your axles are asymmetrical, why shouldn’t your rims be too? The 3m spoke offset of our asymmetrical design (available on all wheelsets except our DH layup rims) means that the spoke lengths for the drive and non-drive side are more equal and so can be tensioned more equally to achieve a higher overall spoke tension and stiffness for the entire wheel. Combined with our consistent and meticulous wheel-building process, this ensures that each wheels will be extremely durable and maintenance free for as long as possible. 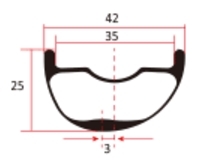 The squat, 25mm vertical height of the rim profile means that forces will be distributed across the profile of the rim more readily and lessen the possibility of pinch flats or “snakebite”. One option for our wheels are our Roost Hubs. The Chosen Roost branded hubs have an amazing 150T engagement free-hub, with a sound that will make any bike enthusiast excited to ride! Roost Hubs are available in front hub spacing 100×15 and BOOST 110×15 as well as Rear hub spacing 142×12 and BOOST 148×12. We Offer DT Swiss Hubs as an option for our wheels if you want something beside out fantastic Roost hubs, DT Swiss 350 & 240 hubs are available. Our DT Swiss hub wheels will ship with 54T star ratchets for the quickest engagement possible. You can order BOOST and non-BOOST spacing DT Swiss wheels through out site, if you are in search of a custom spacing wheelset, including new Super-BOOST (157×12), please send us an email so we can get a set built up for you (additional charges will apply). But, s*** happens. And to keep you riding we have two policies – our 1 year Limited Warranty and Life Time Crash Replacement. Read on. When you buy a set of ROOST wheels we want you to have an excellent experience purchasing, setting up, and using your wheelset. We provide a 1 year warranty to the original purchaser against manufacturer defects covering workmanship, parts, and materials which fail under normal use. During this initial 1 year period ROOST will correct the issue through repair or replacement at no cost. Our warranty will cover you if we screwed up – if you pop a spoke hole out of the rim – if a rim fails at a seam – if your wheelset has imperfections in the carbon – etc. If you break a rim because you smashed it on a rock, run over it with your VW van, or for any other reason – we offer a Crash Replacement purchase option. Send us photos of your busted rim and $225 gets you a new one just as soon as we can get one shipped out to you. Our Life Time Crash Replacement program is for the original buyer only.